A family favourite of ours (and many others I’m sure) is spaghetti bolognese. It’s rich, it’s warming and it’s incredibly easy to make during the week when we’re strapped for time. When it came to living a primal lifestyle, I didn’t see it as a way of ‘giving’ up my favourite foods. Instead, I simply started to tweak them to make them primal friendly. This is exactly what I’ve done with the classic spaghetti bolognese recipe here. 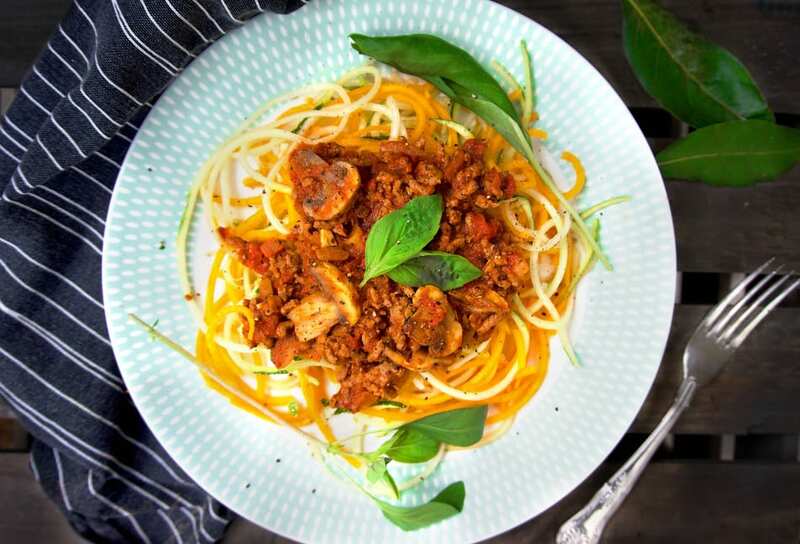 Instead of pairing the bolognese with the spaghetti (which is very high in complex CARB’s) I’ve simply replaced the pasta with spiralized carrots and courgette – two ingredients that are so much better for us, our body and our digestive system. Whilst this recipe may differ a little from the classic recipe (no CARBs), it certainly still delivers flavour, taste and the most important element: comfort. The pairing of the bolognese works wonderfully against the carrots and courgette. The carrots add a nice ‘whole’ texture to the dish and their subtle sweetness pairs brilliantly with the mince and it’s sauce. Another important factor about making this recipe primal friendly is to use lean beef mince that’s organic and grass fed. I can’t stress enough about how important this is. You can check out this post here for more detail about going organic. On top of that, we’ll be making our own sauce (which I hope you do anyway!) so we know the exact ingredients that we’re putting into our body. Not only is this recipe a good source of protein, vitamins and minerals but the volume from the courgette and carrots will also leave you feeling fuller for longer. As for the carrots; they’re one of the most popular vegetables in the world and can be used in many dishes (you just need to be a little creative!). They’re also packed with many health benefits so it’s important that we include them in our diet every now and then. As for the myth that surrounds carrots and that they can help us see in the dark – well it may be true! Carrots have three crucial nutrients – lutein, zeaxanthin and beta carotene – and all of these nutrients help to boost our eye health. Carrots are also great for containing a high amount of antioxidants, can help to decrease the risk of heart decrease, can boost skin health and the healing of wounds and maintains the health of our brain. 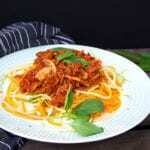 Either way, I hope you enjoy my primal take on the classic spaghetti bolognese recipe. 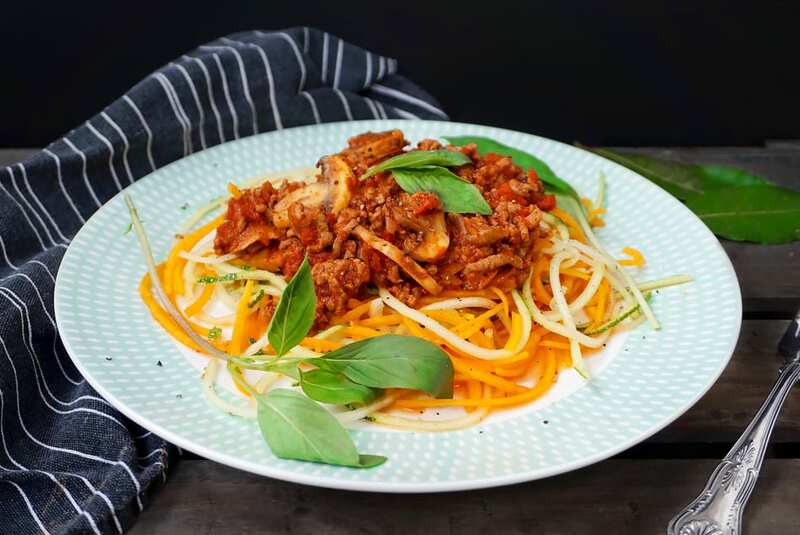 The bolognese sauce is everything a bolognese sauce should be and the carrot and courgette spaghetti adds a lovely subtle sweetness to the dish. Plus, it can be whipped up in less than 30 minutes. As the Italian’s would say… Perfecto! My primal take on the classic home comfort food, Spaghetti Bolognese. This recipe is full of protein, low carb and full of delicious Italian flavours. Heat a pan with a little oil and add your diced onion, garlic, mushrooms, rosemary and oregano and fry for a few minutes until your onion starts to brown. Add your mince meat to the pan and cook until brown. Add the two tins of chopped tomatoes and bring to the boil. Add your bay leaves and fresh basil and bring to the simmer for 15-20 minutes. Whilst your mince cooks, spiralize your carrots and courgette. Just before you serve them you'll want to pop them in the microwave for a minute or two. Cooking them fully will simply turn the soggy. 5 minutes before your mince is cooked, add the tomato puree and salt and pepper the dish to taste. 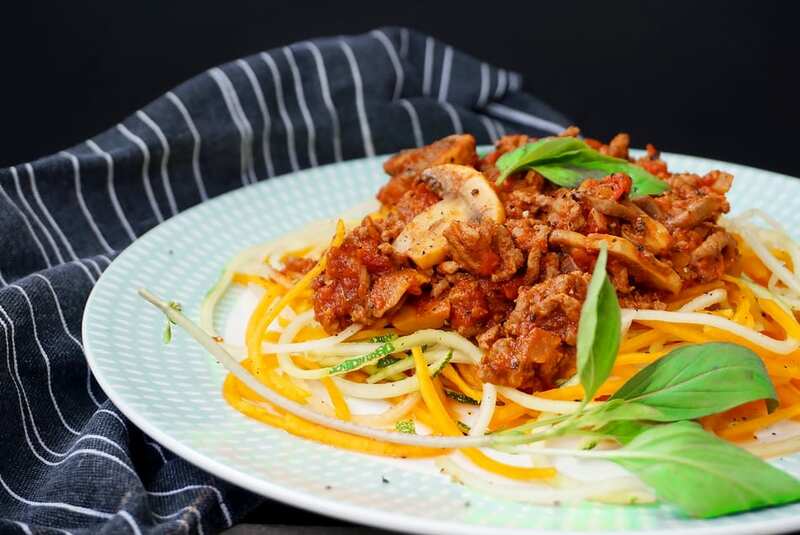 Once cooked, serve your spiralized veg on a plate and top with the bolognese. Add an extra sprinkle of fresh basil if you wish and serve up!